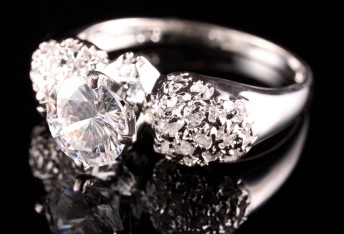 Man Made / Synthetic Lab Diamonds & Natural Diamonds: What is the Difference Between Them? Engagement Rings: Are Synthetic Diamonds the Way to Go? For years now, the engagement ring industry has been flooded with information about synthetic diamonds and real diamonds, causing a huge debate on the issue of which should be used for engagement rings. While natural diamonds are just that–natural–there are a lot of issues surrounding their procurement that make them a heated topic for many human rights activists. Synthetic diamonds also leave the question of legitimacy. How can one tell if the synthetic diamond has been properly created, and how much should one expect to pay for man-made diamonds? And, most importantly, will your future wife love the synthetic diamond just as much as a natural diamond? This article will hopefully help you decide which diamond to get for your fiancee as well as answer some important questions surrounding the synthetic vs. natural diamond debate. The synthetic diamond industry began in the late 1700s, when scientists discovered that diamonds are nothing more than pure carbon. Scientists and researchers quickly began to look for ways to create cheaper, man-made diamonds. By doing this, they planned to create an entirely new market for the diamond industry and turn out huge profits by making their own diamond replicas. Scientists discovered that there are several ways to create diamonds. The two most popular methods are High-Pressure High-Temperature Synthesis, or HPHT, and Chemical Vapor Deposition, or CVD. HPHT is exactly what it sounds like. The carbon is pressed together using anvils that compact upon heating (up to 3500 degrees Celsius) to create the diamond. By using HPHT diamond processing in mass production plants, this method can be very effective for creating a great amount of high-quality diamonds in a short amount of time. In CVD diamond creation, diamonds are grown using a hydrocarbon gas mixture. Various gases are put into a chamber and then energized. In this way, it is much easier to control how the diamond is created, and scientists are better able to control impurities and coloration of the diamond. However, it is possible that diamonds created using the CVD method are contaminated with boron or silica, which come from the chamber in which the diamond is created. Thus, these synthetic diamonds are sometimes less pure than natural diamonds or those created using the HPHT method. For many reasons, buyers are often prone to purchasing a synthetic diamond from a reputable supplier than from purchasing a natural diamond. For example, there has been a huge debate about whether mined diamonds sold in jewelry stores have come from war-torn areas, especially in diamond-rich parts of Africa. Many human rights activists claim that natural diamonds should not be used as engagement rings because the De Beers family and corporation has controlled the diamond market for years, often treating diamond miners poorly. In Sierra Leone, one of the world’s poorest nations, the soil is rich with diamonds. Yet the people recruited (often forcibly) to mine these diamonds are among the poorest of the earth’s inhabitants. For nearly two decades, the people of Sierra Leone fought a vicious civil war over, in part, the fact that they receive little to no payments for their natural resources and manual labor in diamond mining. By asking your jeweler about the history of your diamond, you can receive certification that a diamond did or did not come from an area of war. However, this process is not entirely foolproof, since the De Beers family controls the diamond market. The Kimberley Process, unfortunately, is often merely a paper trail that claims that diamonds do not come from war-torn areas, when in fact they usually do. Buyers are not always able to trust that their diamond has not been procured in a dishonest way. Another reason that many buyers are now turning to synthetic diamonds is that they are cheaper than natural diamonds. By most estimates, synthetic diamonds either grown or created using heat and pressure are roughly 15% cheaper than natural diamonds of comparable size. Also, synthetic diamonds often look exactly like natural diamonds to the naked eye. Jewelers have claimed that synthetic diamonds are identical to natural ones chemically, optically, and physically. There are ways to examine your diamond up close by using spectroscopy in infrared, ultraviolet, or X-rays. Also, the De Beers Corporation has developed the DiamondView tester to test for impurities in synthetic diamonds. Often these impurities come from the development process, but are not readily visible. By purchasing a diamond from a synthetic diamond dealer, buyers will receive a certification verifying that the diamond has been created in a lab, and diamonds are often laser-engraved with an identification number to trace back to the supplier for future reference. Synthetic diamonds can also come in many colors, including yellow, brown, blue, green, orange, or clear to white. This opens up new opportunities to buyers who wish to have a greater selection of diamonds without paying the high prices of natural diamonds. If you wish to purchase a synthetic diamond, you have a few different choices. Apollo Diamond Company creates their diamonds in a lab using the CVD method. They offer a variety of diamond choices and styles, and they are currently the only synthetic diamond producer creating colorless synthetic diamonds. Each diamond they sell is certified as being 100% diamond, and each diamond over .25 carats will be laser-inscribed with a serial code for reference information. For more information on pricing and sales, visit their website at www.apollodiamond.com. Another popular synthetic diamond company is the Diamond Nexus Labs. They offer a wide variety of synthetic diamond products, including necklaces, engagement rings, wedding rings, bracelets, and other pieces of jewelry at a fraction of the mined-diamond price. Diamond Nexus Labs also have an option for customers to create their own diamond, allowing your imagination to choose which diamond style you would like to have. Their diamonds also come with a lifetime guarantee, with the promise that your diamond will never discolor, chip, or break. In addition to synthetic diamonds, Diamond Nexus Labs also offer other synthetic stones, including sapphires, rubies, and emeralds at a fraction of the market price for mined stones. For more information on Diamond Nexus Labs, or to create your own synthetic jewelry, visit their website. With all the benefits of synthetic diamonds, the choice should be an easy one. Synthetic diamonds are cheaper, safer, and physically, optically, and chemically identical to the natural diamond. However, there are also options out there for those who wish to purchase mined diamonds from no-conflict zones by using the Kimberley Process documentation. Either way you want to go, this article should be helpful in making the decision between buying a natural diamond or a synthetic diamond for your loved one. Whichever option you choose to take, it is a guarantee that your bride will be dazzled by the beauty of her ring. Let your love shine with a beautiful diamond engagement ring. This last summer I was very impressed with Diamond Nexus, selection and quality, after convincing my fiance of the benefits of a lab created diamond, we went back to the Diamond Nexus website to find the lab created diamond selection to be reduced to a pathetic selection of yellow stones and no clear stones are available at all. If I want to give a cheap fake replica of a diamond and cheap fake replica of gold or platinum, I will be looking for a cheap fake replica of my fiance. Has Diamond Nexus sold out to the diamond cartels or been pressured into discontinuing their high quality products by the mined diamond industry? We looked in the current Nexus catalogue and it is pathetic compared to the previous inventory offered. What happened and can you recommend a dealer or manufacturer of man made white or clear pure carbon diamonds? In response to Frank.. 2 years later and I see lots of clear diamonds on Diamond Nexus. I don’t know anything about their backstory, but whatever the situation was two years ago seems to have changed.